Costa Rica, which literally translates to ‘Rich Coast,’ was first so-named by Christopher Columbus who sailed here in 1502. When he encountered indigenous tribes clad in gold jewelry, he assumed that the land must be full of rich gold reserves. And though he would eventually be proven correct, gold was not discovered there until centuries later. But, what Christopher Columbus did not know was that his naming of Costa Rica was perhaps prophetic, but not for its minerals. In 1975, Costa Rican President Daniel Oduber created Costa Rica’s first national parks to protect the country’s over 500,000 species of flora and fauna and the land they occupied. Costa Rica’s landmass makes up only one third of a percent of the world’s total. But, it is home to over 4% of all the species in the world. This makes Costa Rica the most biodiverse country in the world and ranks it amongst the highest in biodensity (the number of species per unit of landmass). How does this translate to the those visiting the wild places of Costa Rica? It interprets to being in constant close proximity with wildlife, whether it be with its colorful macaws and parrots, its technicolor frogs and snakes, or the incredibly large mammals that patrol the jungles by day and night. The Backcountry Journeys Costa Rica tour takes place entirely on the Osa Peninsula, in the country’s far southwest. The Osa Peninsula is unique even amongst other Costa Rican natural areas. For one, it is home to the largest swath of Pacific rainforest in all of Central America. And, the majority of the landmass of the Osa falls within the boundaries of Corcovado National Park, the largest national park in the country. Corcovado National Park is a truly wild place, and is the only national park within Costa Rica large enough to support populations of Jaguar and Baird’s tapir (if you don’t know what that is, imagine a 600+ pound herbivore that looks like the love child of an elephant and a horse but whose closest living relative is the rhinoceros). For the BCJ Costa Rica tour, we will visit Corcovado National Park and the areas surrounding it to seek and photograph the incredible array of wildlife that we will undoubtedly encounter. This guide is an introduction to some of the key species that call the Osa Peninsula home. First up, we have most people’s favorites; the cute and furry. Costa Rica is home to over 250 species of mammals, but over half of those are different species of bat. Most mammals encountered are in the medium-sized range, and include monkeys, sloth, anteaters, and coati. Also present though, are several larger species, including five species of wildcat, the previously mentioned tapir, and a voracious weasel-like animal called a tayra. Costa Rica is home to four species of monkey. They are the white faced capuchin, the mantled howler monkey, Geoffrey’s spider monkey, and the squirrel monkey. Clients on the BCJ Costa Rica your will surely encounter all four species of monkey. The white faced capuchin is the most famous of the four local species. It is also the most intelligent of the four. It is regularly witnessed using tools to crack open nuts and pick insects from tree trunks. It is an omnivore, feeding off fruits, nuts, insects, small mammals, and bird eggs, amongst other food sources. The capuchin is also the species of the monkey with a starring role in the Pirates of the Caribbean movie franchise. They are inquisitive and playful and a joy to observe. They are a threatened species due to deforestation and the black market pet trade. The mantled howler monkey is distinct from the other four species in size and behavior. It is the largest amongst Costa Rican primates, and it does not swing or jump from limb to limb like the other three; it slowly and deliberately crawls on all fours from one branch to another. They are somewhat clumsy, and have been seen falling from trees from time to time. Even if you were to somehow miss seeing the mantled howler monkey, you will undoubtedly hear it. It’s lion-like roar can be heard from miles away, and is amongst the loudest calls in the animal kingdom. Passing motorcycles or cars often set an entire troupe off into a chorus of raucous roars. The spider monkey is the most acrobatic of the four monkeys, and is also quite playful, like the capuchin. They can easily be identified by their long limbs and swinging style. They often eat hanging by their tails upside down in the tree tops. And upon closer contact, you will see that have distinct white circles around their eyes. The squirrel monkey, the smallest of the Costa Rican monkeys, is also the most colorful. It is also the only monkey species in Costa Rica that does not have a prehensile tail (it cannot grab things with its tail). Most everyone coming to the Osa Peninsula to observe wildlife comes hoping to see at least one of the five species of wildcat that live amongst its jungles. And though these animals are extremely elusive, sightings are relatively common if you are in the right place at the right time. The five species of wildcats in Costa Rica are the jaguar, puma, ocelot, jaguarundi, and margay. The jaguar is without a doubt the most famous, but this powerful cat is rarely seen by visitors. What is far more common though, especially for those visiting Corcovado National Park, is seeing a puma. The puma is in every way genetically identical to the cougar of North America. In fact, this species is the widest ranging of all big cats, with a range extending from Alaska all the way through Central America, South America, to the southern tip of Patagonia. The Central American puma is smaller, though, than the North American cougar, and attacks by the Central American puma upon humans is virtually unheard of, also unlike the North American cougar. The three other species of wildcat are considerably smaller than the top two. The beautifully spotted ocelot tops out at around 35 pounds. They can be seen darting across jungle roads or stalking dry creek beds at night. The jaguarundi, considered somewhat jokingly to be Costa Rica’s ‘ugly cat,’ tops out at around 20 pounds. It has a solid coat, but its color varies from near black all the way to a tawny blond. And lastly, Costa Rica’s smallest cat, the tree dwelling margay. It also sports a spotted coat, but sightings are rare due its nocturnal and arboreal behaviors. A medium sized mammal we will surely encounter is the white nosed coati. This dark brown, ring-tailed mammal is in the same family as the raccoon. But, it is distinct with its long flexible nose and sometimes enormous family groups. These animals are opportunistic omnivores, and feed off fruits, insects, and sea turtle eggs, amongst other food sources. Another likely encounter will be with the northern tamandua, a medium-sized anteater. It has a coat of white and black, with a pattern that looks as if it is wearing a black vest. They are active during the day and night. When confronted, they are more likely to stand their ground than flee. If feeling threatened, it will stand up on its rear legs, assuming a boxer’s pose, ready to strike out with its incredibly strong front claws. Also present and commonly sighted are two species of giant rodent. These are the agouti and the paca. They both resemble giant tailless rats. The agouti maxes out around 10 pounds, while the striped and spotted paca can grow to weights in excess of 30 pounds. Another notable mammal would be the tayra. It resembles a large weasel or pine marten, and is a fierce predator. They are also active in both day and night, but rarely pause to pose for a picture. Other Osa mammals are the aforementioned tapir, possums, armadillos, sloths, deer, and aquatic mammals such as humpback whales and dolphins. Costa Rica is without a doubt a birder’s paradise. 894 species have been recorded to date, which is more than Canada and the U.S. combined. The most iconic of the Costa Rica birds has to the the scarlet macaw. This highly endangered species of large parrot is rarely seen in areas other than the Osa Peninsula. But, here on the Osa, they are so numerous that American ex-pats have taken to calling them rainbow crows. These incredibly colored birds can be raucous and noisey, especially around mating season, as mated pairs compete for the best nesting spots. Macaws mate for life, but are often seen in groups of three, with a grown offspring still foraging with its parents. Another famous Costa Rican local is the toucan. There are six species of toucan in Costa Rica, but the one most commonly seen on the Osa is the black mandibled toucan. This large bird, with its iconic beak, is omnivourous. As well as eating fruits and nuts, it exhibits voracious predatory behaviors, targeting lizards, birds, and small mammals. Other large tropical birds commonly seen on the Osa are the fiery billed aracari, quetzal, mealy parrot, orange chinned parakeet, and motmot. But, also prevalent are the marine bird species. Visitors to the Osa will undoubtedly witness the magnificent frigate bird, herons, and ibis, as well as wood storks and spoonbills. Amongst the raptors present are the iconic harpy eagle, black hawk, white hawk, peregrine falcon, and the enormous and stark-white king vulture. Also, commonly seen foraging for carrion or prey along the roadsides are the caracara and roadside hawk. And as for the smaller birds, commonly sighted are several species of trogan, hummingbirds, woodpeckers, and tanagers. With such an array of birds here to observe and photograph, a birder could spend a lifetime here and still not see them all. If you’re like me, it is often the things that slither and slime that present some of the most interesting photographic opportunities. And Costa Rica is home to an enormous array of cold-blooded critters. Amongst them are nearly 130 species of frog, 70 species of lizard, and over 120 species of snake! The frogs of Costa Rica present a unique photographic opportunity, especially if you are a macro-phile. Some of my favorite species to photograph are the glass frogs, so named for their transparent skin allowing their little bones and internal organs to be easily seen with the naked eye. They are mostly active at night, and can be found on leaves and tree branches above streams and ponds. Another favorite is the red-eyed tree frog. This dazzlingly colored frog, with its vertical blue stripes and blood-red eyes is an unofficial mascot of Costa Rica, making their way into much of the art on hotel walls throughout the country. Another famous family of frogs is the poison dart frogs. Each species of poison dart frog creates a toxic mucous that they excrete when threatened They advertise their toxicity with brightly colored skin patterns, such as the motley green and black poison frog or the bright red strawberry poison frog. They are harmless unless eaten, so don’t be afraid to get close for a photo. But, the green and black poison dart frog can produce enough toxin to stop a human heart! Like the birds of Costa Rica to a birder, the snakes of Costa Rica represent a herpetologist’s paradise. Of the 120 species of snake found in the country, 20 are venomous. There are many other rear-fanged snakes that produce mild venoms that do not fall into this classification, such as the commonly sighted northern cat-eyed snake. A real treat for any visitor is finding a giant boa constrictor. These non-venomous, powerful snakes are beautiful and can grow to enormous sizes. Of the venomous snakes, eye-lash vipers are amongst the most beautiful. There are also coral snakes, the neotropical rattlesnake, and several species of pit viper, including the infamous fer de lance, also known as Bothrop’s viper and terciopelo in Costa Rica. Though dangerous, these snakes can be observed and photographed safely if done so from a safe distance and by a calm and quiet photographer. 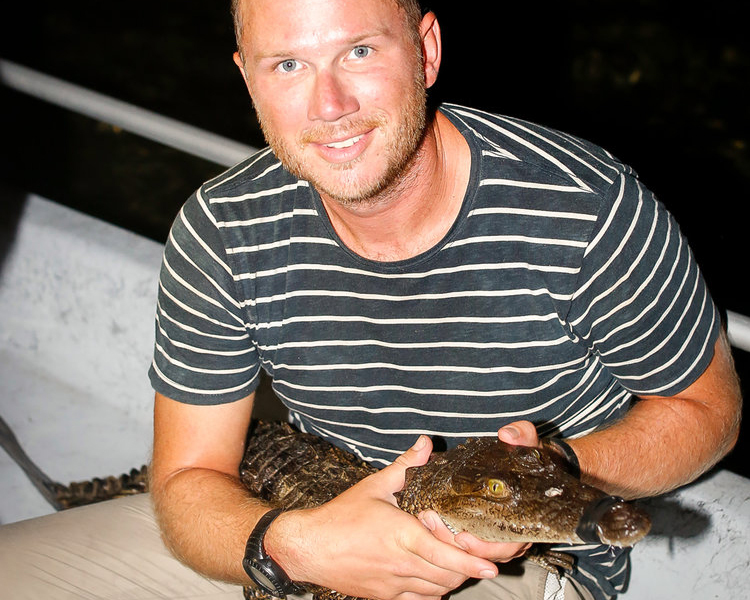 Also common on the Osa Peninsula are two species of crocodilian; the smaller spectacled caiman, and the larger and sometimes dangerous American Crocodile. Both species live in the lagoon that will be visited on the BCJ tour, and are easily observed at night swimming the lagoon in search of fish and small mammals. The beaches that line the Osa Peninsula are also a nesting ground for two sea turtle species, the olive Ridley sea turtle and the green sea turtle. Throughout the year, females leave the water in the dark of night and crawl onto the beach to dig a nest and lay her clutch of eggs. Day nesting does occur, but is far more rare. Though most people tend to want to avoid both of these types of critters, Costa Rica is home to some incredibly beautiful and bizarre invertebrates. Most sought after by photographers are the beautiful butterflies, such as the blue morpho and owl butterfly, tarantulas, wanderer spiders, and harlequin beatles. Though there are a couple spiders that could potentially pose a threat to people, bites are very rare. Butterflies can be observed flying in the day and roosting at night, especially along creek beds. Most of the big spiders are ground dwelling, but wandering spiders can regularly be seen ascending tree branches and other jungle plants in search of small lizards to prey upon. Because of the incredible biodiversity of Costa Rica, it represents endless opportunities to the wildlife photographer. Whether your interests are in large mammals, reptiles, or birds, you will encounter a large array of species with staggering regularity. As one who has spent the better part of two years living on the Osa, I will tell you that if animals are your passion, then there are few better places to visit than the most biodiverse country on planet earth!